Vintage Blue, a new Chicago band whose debut album is coming out this February. Chicago’s Vintage Blue is the musical equivalent of comfort food. The rock band’s sound is familiar and accessible without a hint of pretense. Vintage Blue’s lead singer Ben Bassett describes it “contemporary classic rock,” as the group’s songs use “vocal harmonies and sax found in Creedence [Clearwater Revival], the Eagles and [Bob] Seeger tunes, and add in a touch of pop and synth and organ to create a sound that is new, but recognizable.” It seems like the perfect recipe to become Chicago’s next buzz-worthy bar band, and perhaps something bigger. 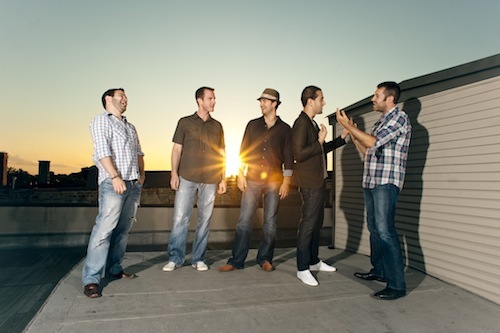 The band consists of five members — guitarist Ryan Tibbs, drummer Will Cowden, bassist Cesar Corral, saxophonist and keyboardist Matt Zimmerman and lead singer and guitarist Ben Bassett — three of whom hail from the greater Chicago area, one who is originally from Central Pennsylvania and Bassett, who grew up in Northern California. Not all that long ago Vintage Blue went by a different name, Tanglewood, when they performed mostly covers. But now the group is armed with 13 new and original songs and a debut album, Strike the Mics, coming out on February 14. You can hear the new tracks this Saturday at Subterranean, where Vintage Blue will have their official CD release party. We recently had the chance to catch up with Vintage Blue lead singer Ben Bassett, and asked him about creating the groups first album, using personal experiences to craft songs, and learning from the trials and tribulations of starting out as a cover band. 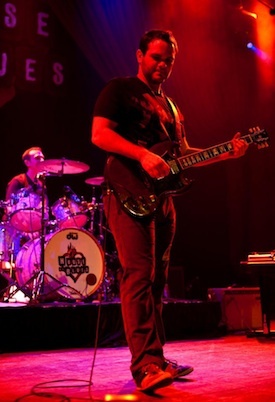 Ben Basset of Vintage Blue performing at the House of Blues. Photo from Vintage Blue's Facebook page. Man Up Chicago: The group, when it went by Tanglewood, performed cover songs. What did you learn about performing live during your days doing covers? Ben Bassett: Actually, we learned a lot from our days as a cover band. For one, we learned about fans and interacting with them. We learned that not everything we think is amazing will go over every time. For example, we worked on covering “Livin’ on a Prayer” for a huge show a couple years back. We were so stoked. I had bought a nice Ibanez with a whammy to cover the Sambora solo and a talkbox to do the intro justice. We rocked the song and when we hit the last chord there was just silence. We were like … “what the hell?” Ha ha. But it taught us that on any given night a crowd could totally dig your music, or be just out of it. We learned to roll with the punches and just put on our best show no matter what. In a way, playing in a cover band toughened our skin and gave us the confidence to write and perform our own music. MUCh: When did Vintage Blue officially form? And is there a story behind the name Vintage Blue? BB: Vintage Blue officially formed in August of 2011. It came about after a consultation with a record label exec who came on board to help assist and guide us in releasing our new record. After that conversation, which detailed things like search engines, similar names and marketing strategy, we gave ourselves one week to come up with something new. We loved the word ‘vintage.’ The definition of the word that we read included all the things you hope your music would be; of a higher quality, long-lasting, memorable, classic, etc. We liked the idea of using the word. Then we started playing with colors. We really liked the idea of blue for a number of reasons. One, Chicago is the home of the Blues! We liked the idea of tying ourselves to such a great city, making great music. We also liked the feeling of blue, sort of chill, relaxed, calm, and cool. MUCh: How would you describe your time in the studio recording your album? Was the experience like you expected it to be? BB: Because we were lucky enough to work with Jamie Candiloro on our album, our experience in the studio was amazing. Jamie is a consummate professional in every sense of the word. That said, he also expected us to be at our very best. Heading into the recording sessions we had been a group of guys that played music for fun and to entertain our friends and fans. Going into the studio with such an accomplished producer and musician was eye opening. Like a great head coach, Jamie was able to pull the absolute best out of each of us, which led to a product we are immensely proud of. But it didn’t come without tough times. There were many nights when Jamie and I would be in the studio until 3am working on mixes or guitar patches. While I will never recover from my sleep deprivation, the result in unquestionable. 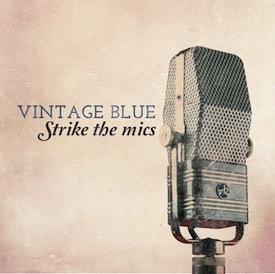 The cover of Vintage Blue's debut album, Strike The Mics. MUCh: In a press release for your new album, it’s said that the music on this upcoming record “speaks to our lives, our loves and our passion.” Are there particular songs that are about particular moments in your lives? Are there particular moments from your lives that inspired a specific song or songs? BB: There are absolutely ties to moments in our lives in every song. For me, I penned seven of the tracks on the record, and each of them has a very specific moment tied to it. One of the easiest to recall is “Just Breathe.” That song was written at a time when everything around me seemed amiss. I had recently lost my job and was having a tough time in a relationship and really felt trapped. I played the main riff over and over and just kept kind of singing lyrics about relaxing and taking a mental break, then just breathe came to me. Another song on the record, “What Lies,” which is written by Ryan, was written while he was on vacation in Costa Rica, and he was speaking to the fleeting feeling of experiencing love in a romantic setting, but knowing that it is only temporary. MUCh: When Vintage Blue isn’t performing or practicing, what do band members like doing in Chicago? Do you guys have any favorite spots that you hang out at? BB: We only practice, 7 days a week. Kidding, kidding. Our guys are pretty dedicated workers and we all have full time jobs to support our music habit. But on the weekends you can find us out at bars around the city. We also try to go check out local music, including our friends in Farraday, Workout Music and South of 80. As a band we do not have a particular hang out, but generally go to places in Bucktown, near our practice space. MUCh: You guys have some shows in Chicago in the coming months, but you’re also doing a Midwest tour. Do you know when you’ll be hitting the road? BB: Well, we call it a weekend warrior tour. Since all the members are working guys, we have to choose our spots on when and where we go. We consider ourselves to be hitting the road probably late February through April. We are working on shows in Detroit, Minneapolis, Nashville and New York City. We have already booked shows in Milwaukee and downstate. Vintage Blue will be performing at 7:30 PM on Sat., Jan 21 at Subterranean in Wicker Park (2011 W. North Ave.). The show is currently sold out — feel free to pester the band on their Facebook page to see if they can get you in. They will also be playing at the House of Blues on March 10. For more information on Vintage Blue and their new album, check out their website. Listen to their track “Speak” below.